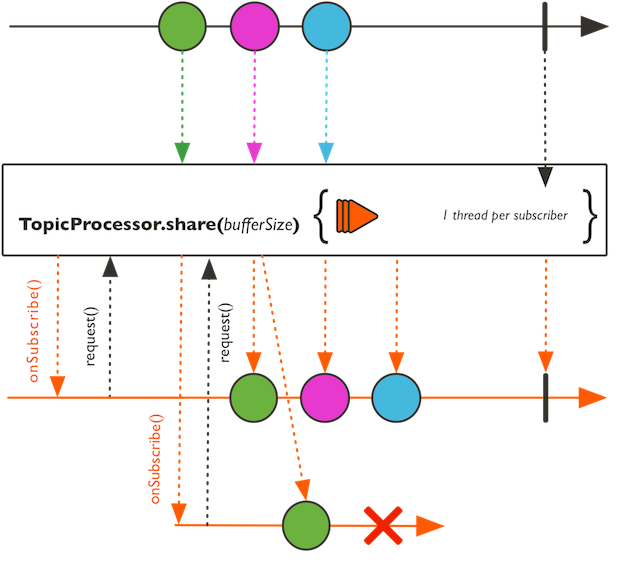 An implementation of a RingBuffer backed message-passing Processor implementing publish-subscribe with async event loops. Created from share(java.lang.String, int), the TopicProcessor will authorize concurrent publishing (multi-producer) from its receiving side Subscriber.onNext(Object). Additionally, any of the TopicProcessor will stop the event loop thread if an error occurs. The processor respects the Reactive Streams contract and must not be signalled concurrently on any onXXXX method if share(java.lang.String, int) has not been used. Each subscriber will be assigned a unique thread that will only stop on terminal event: Complete, Error or Cancel. If Auto-Cancel is enabled, when all subscribers are unregistered, a cancel signal is sent to the upstream Publisher if any. Executor can be customized and will define how many concurrent subscribers are allowed (fixed thread). When a Subscriber requests Long.MAX, there won't be any backpressure applied and the producer will run at risk of being throttled if the subscribers don't catch up. With any other strictly positive demand, a subscriber will stop reading new Next signals (Complete and Error will still be read) as soon as the demand has been fully consumed by the publisher. When more than 1 subscriber listens to that processor, they will all receive the exact same events if their respective demand is still strictly positive, very much like a Fan-Out scenario. When the backlog has been completely booked and no subscribers is draining the signals, the publisher will start throttling. In effect the smaller the backlog size is defined, the smaller the difference in processing rate between subscribers must remain. Since the sequence for each subscriber will point to various ringBuffer locations, the processor knows when a backlog can't override the previously occupied slot. A simple reusable data container. TopicProcessor builder that can be used to create new processors. Determine whether this Processor can be used. Block until all submitted tasks have completed, then do a normal EventLoopProcessor.dispose(). Block until all submitted tasks have completed, then do a normal EventLoopProcessor#dispose(). Create a new TopicProcessor TopicProcessor.Builder with default properties. Create a new TopicProcessor using Queues.SMALL_BUFFER_SIZE backlog size, blockingWait Strategy and auto-cancel. Create a new TopicProcessor using the provided backlog size, with a blockingWait Strategy and auto-cancellation. A method to extract a name from the ThreadFactory if it turns out to be a Supplier (in which case the supplied value string representation is used). A method to create a suitable default ExecutorService for use in implementors requestTask(Subscription) (a cached thread pool), reusing a main name and appending [request-task] suffix. Drain is a hot replication of the current buffer delivered if supported. Shutdown this Processor, forcibly halting any work currently executing and discarding any tasks that have not yet been executed. Return the number of parked elements in the emitter backlog. Has this upstream finished or "completed" / "failed" ? Create a new shared TopicProcessor using the passed backlog size, with a blockingWait Strategy and auto-cancellation. Shutdown this active Processor such that it can no longer be used. A new Cached ThreadExecutorPool will be implicitly created. A new Cached ThreadExecutorPool will be implicitly created and will use the passed name to qualify the created threads. 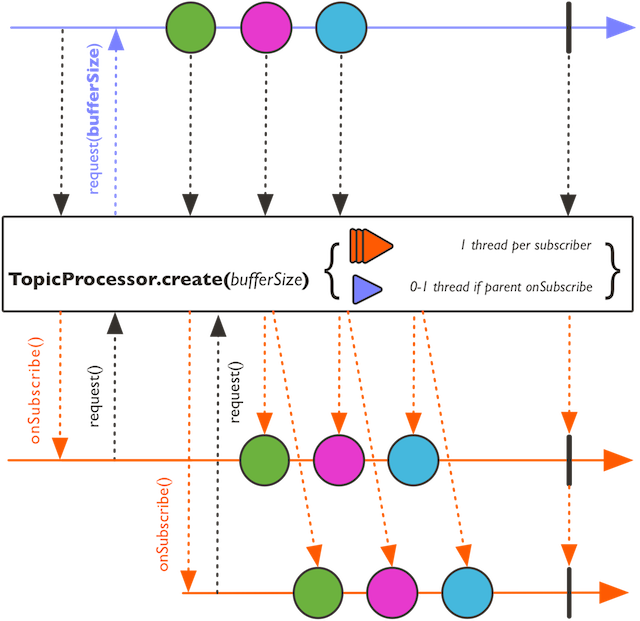 A Shared Processor authorizes concurrent onNext calls and is suited for multi-threaded publisher that will fan-in data. Drain is a hot replication of the current buffer delivered if supported. Since it is hot there might be no guarantee to see a end if the buffer keeps replenishing due to concurrent producing. a Flux sequence possibly unbounded of incoming buffered values or empty if not supported. the number of parked elements in the emitter backlog. A method to extract a name from the ThreadFactory if it turns out to be a Supplier (in which case the supplied value string representation is used). Otherwise return the current class's simpleName. name - the main thread name used by the processor. a default ExecutorService for requestTask. true if this Resource is alive and can be used, false otherwise. timeout - the timeout value as a Duration. Note this is converted to a Long of nanoseconds (which amounts to roughly 292 years maximum timeout). Returns serialization strategy. If true, FluxProcessor.sink() will always be serialized. Otherwise sink is serialized only if FluxSink.onRequest(java.util.function.LongConsumer) is invoked. Shutdown this active Processor such that it can no longer be used. If the resource carries any work, it will wait (but NOT blocking the caller) for all the remaining tasks to perform before closing the resource.